Soros boogeyman, infinity war, Make America’s Building Codes Lax Again, keeping Obamacare secret, Trump appointee 48,239th resignation, Crosby chemical plant explodes, tax plan details, Was Obama President during Katrina? : Survey says…, first-hand destruction, Dreamers’ nightmare, Russia’s Reichstag Fire, and “donations”. All this and more in your daily Trump Damage Report for Thursday, August 31st, 2017. Blackwater moneybeg, walls or bottled water for disasters?, UN free press concerns, Kremlin on Cohen, Mattis contradicts, Complicity Trump, lacking empathy, how to get rich in Trumpland, Flake flak, and the Arpaio pardon challenge. 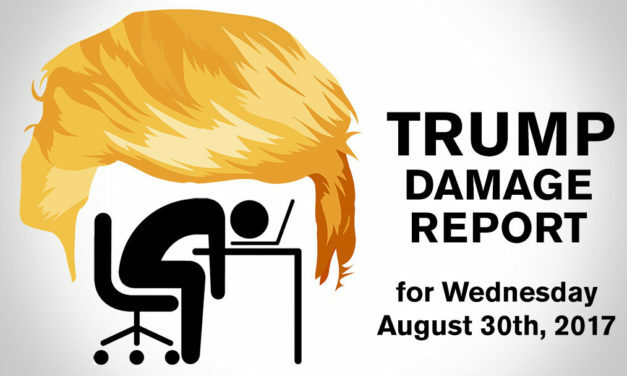 All this and more in your daily Trump Damage Report for Wednesday, August 30th, 2017. Covering immigrant deaths, Spiceypope, 16% like Trump, Tower cover-up, sold-out swamp, internet crimes, crowd size problems, killing the GOP, hurricane hypoCRUZy, timing Arpaio, and not letting science dictate policy. All this and more in your daily Trump Damage Report for Tuesday, August 29th, 2017. Arpaio vs. Flake, Cohen asks Putin, Mexico helps (not with the wall), Rove’s playbook, time to impeach, pressuring intelligence on Iran, militarization of the police, he’s our a-hole, Moscow Trump Tower, getting back to you on that, and the great tax distract. All this and more in your daily Trump Damage Report for Monday, August 28th, 2017. A great nation with an unstable leader, career grifters, Black Friday, Nazi arrests, just talk about opioids, ICE stranding immigrants, Tillerson distances, battle for the soul of a nation, Arpaio’s evils, Sinclair’s fake news factory, and behold – a child king. All this and more in your daily Trump Damage Report for Sunday, August 27th, 2017.